Have you happened to drive past our Community Garden lately? If not, you should go take a look — it’s on Dallas between Ninth and 10th, and it’s really starting to look like… a community garden! Constructors Inc. has put in paving, Sun Country Garden Center has donated fruit trees and plants, Navajo Refining has donated a bench and flag pole, which Giles Inc. set up, and the local John Deere dealership has loaned a small tractor to help move that dirt! 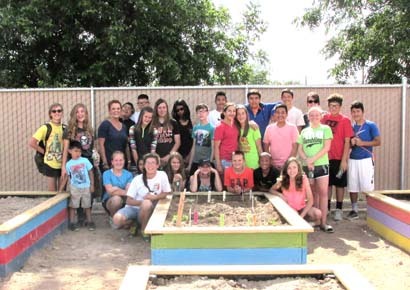 The latest addition to our Community Garden was done this week, when students from Zia Intermediate School in Amanda Riley and Rachel Casey’s classes met out there to plant seedlings started in their classrooms: watermelon, cucumbers, pumpkins, tomatoes, okra, squash, and even some flowers. 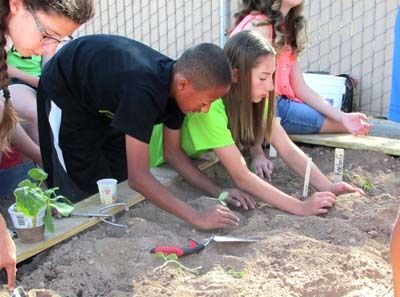 Zia’s involvement began with the students reading about urban community gardens and discussing the concept of a neighborhood garden as a way of bringing people together. The novice gardeners were assisted by Ginny Bush of the Chase Foundation, Youtsey, and City of Artesia Water Department Supervisor Jennifer Estrada, as well as a few members of the community. The weather was warm, and the bottled water donated by Central Valley Electric was appreciated! Future plans for the garden include: a fish pond, a gazebo, a grower’s market to sell produce raised in the gardens, a greenhouse, a small jungle-gym area for kids to play in while parents garden, a dog park, and some handicap-accessible planters, which will hopefully be ready for the 2018 growing season. But right now, the most pressing need is for help to lay some pavers. 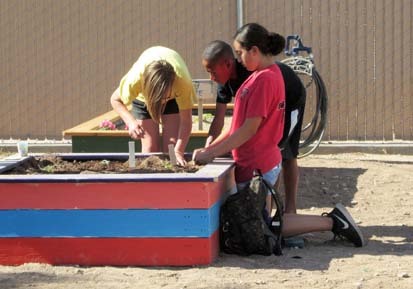 If you’d like to help, or start your own garden, or just see what’s going on, contact the group on their Facebook page: My Neighborhood Community Garden Artesia NM.